Hailing from Texas, Carolyn Martin, along with her husband David, have come a long way in our Nashville musical family. Her love of music started at a very young age and she has continued to pursue her passion for music. She was the 2008 recipient of the Academy of Western Artists' Will Rogers Cowboy Award for Western Swing Female Vocalist of the Year. 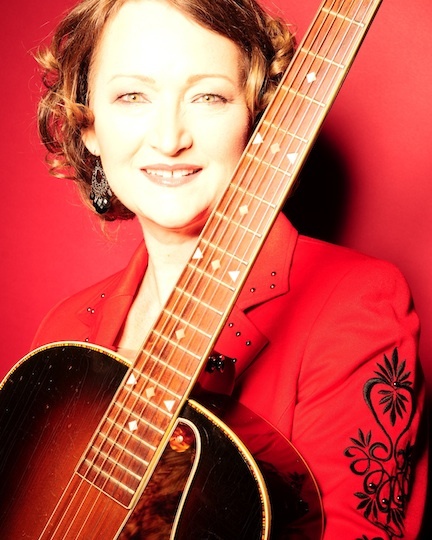 Carolyn has shared the stage with scores of other great singers and some of the best musicians Nashville has to offer, spending 11 years as a member of the world famous Time Jumpers. Actively touring with a brand new record out, singing, songwriting and playing her rhythm guitar better than ever, Carolyn's music makes folks smile and tap their foot while she entertains them. The following is taken from a June 16th studio interview. Meet Carolyn Martin. Carolyn: I am, Abilene, Texas. Carolyn: Mid 80's, 1985. The great snow storm of 1985, in January. Bronson: How long have you been playing and singing? Carolyn: I started playing professionally in the late 70's. I had been out on the road with my husband David for several years and we decided to make the move to Nashville. We tried living in Dallas, Texas for a little while and we tried living in our home town of Abilene, trying to make a living in the music business there and found it to be impossible, (laughing) so we knew that we were going to have to move to a larger city, a music center. We followed the advice of several people who told us that if we were going to move to Nashville, to give it 3 years or not to even come. So we made the move with enough resources to where we wouldn't have to start working immediately. It transpired that after we moved here, since we still had all our PA equipment and we had been on the road for years, the booking agent would call and we would go and do some road dates, 2 or 3 weeks at a time, then come back to Nashville. After we were here for a while we discovered that we were gonna need to stay here, rather than keep going out on the road, so we sold all our PA equipment (laughing). Figured that would be a good way to keep us here and it worked like a charm. We got a job playing as a duo at Cajuns Wharf restaurant, which is long gone. That was a great place and we played happy hour there. Bronson: And why the guitar? Carolyn: I was in love with music and I was a huge fan of Judy Collins and Joni Mitchell, and Crosby, Stills and Nash, as well as Tammy Wynette, Loretta Lynn, and those people with the exception of Tammy Wynette, played guitars and I wanted to play guitar too (laughing). Bronson: Was there someone in your family that played? Carolyn: My brother played a little guitar. He and his buddies had a band when they were in junior high school, but it was a passing fad for him, it was not for me. I fell completely in love with it. Bronson: So you took lessons? Carolyn: Yes, I took lessons from a man named Buddy in Abilene and then for several years from a lovely wonderful woman named Darlene Galloway. Bronson: You've played with so many people, 11 years with The Time Jumpers. Any special nights in particular you remember? Carolyn: I got to sing with Larry Gatlin one night, that was a huge thrill. B.J. Thomas was in there one night and Don McLean. Jimmy Buffet, Jack Greene, the late Billy Walker, Jeannie Seely, there's so many. Bonnie Raitt was in one night and I had to go over and kneel at her feet (laughing). Bronson: Didn't you just come out with a new record? Carolyn: I did, it was released January of 2010. It's called "Cookin' With Carolyn". The centerpiece is a song called, "That's What I Call Cookin'", and my husband David and I wrote that one. When we originally came up with the concept for the album, all of the songs were going to be about cooking or food, something like that. I love to cook. We have a theme song that opens and closes the album and my friend and former bandmate in the Time Jumpers, Jeff Taylor, wrote that. We wanted to make a fun record, something that people could listen to and tap their feet. It's happy music, happy songs, it's kind of a little escape for 35, 40 minutes. Bronson: Do you have any shows or events coming up that you'd like to mention?